Or course, Arnold was there in prison -- but if you’re NOT in prison, Dry Tortugas National Park is absolute paradise. With just 60,000 annual visitors and accessible only by boat or waterplane, the chain of seven islets (including the preserved Fort Jefferson, which housed Arnold from 1865 to 1869) 68 miles off the coast of Key West, Florida is one of America's least visited national parks, but its unique scenery and history make it a treasure worth putting on your bucket list. The islands are as close as you’ll get to feeling like Robinson Crusoe (or on an episode of Lost, if you prefer). 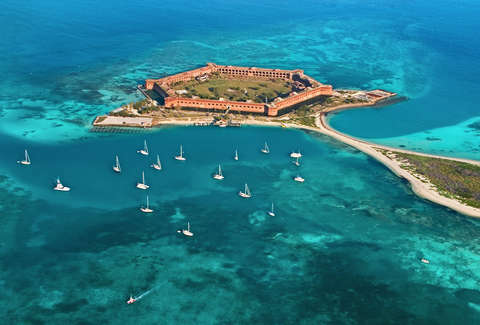 Overnight stays give you a chance to appreciate the remote, natural beauty of the Dry Tortugas, though part of the draw here is that you can experience much of it in a day, unlike some national parks that you couldn’t see all of in a lifetime. But, more importantly, it’s a park that may not be around very long. Climate change has already shrunk some of the seven islands by half. And as seas continue to rise, the land on the islands continues to vanish, so you should probably see it while you still can. After the War of 1812, the US built a series of coastal forts to protect its eastern border, stretching from Maine to Florida. 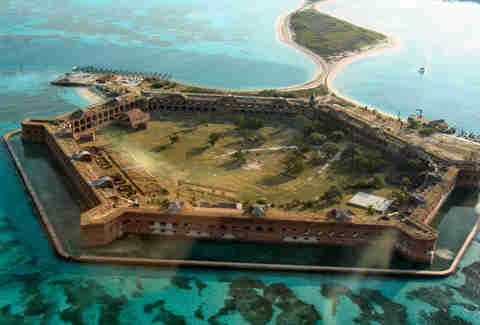 The one erected on Dry Tortugas' Garden Key -- Ft. Jefferson -- was an epic project containing 16 million red bricks, and the most advanced military building project of its time. The six-sided fort doesn’t contain a single construction joint, but still sports arches and entryways, and is the largest masonry structure in the Western Hemisphere. And on a hot day it can expand nearly 2ft in width without any residual damage. At its height, the fort housed 1,729 people and was more densely populated than Manhattan. But beyond troops, the fort also served as an island prison, like a Florida version of Alcatraz. It mostly housed army deserters, but its most notable inmate was Dr. Samuel Mudd, the man who assisted and housed John Wilkes Booth for two days after he assassinated Abraham Lincoln -- along with the quotable Samuel Arnold. You can take a ranger-led tour of the fort most days as part of your $10 park admission. But the tours aren't scheduled regularly so if you take your own boat in you'll have to see when -- and if -- they're running. If you take the ferry out, a scheduled tour is included in the price. Self-guided tours are, of course, always available. 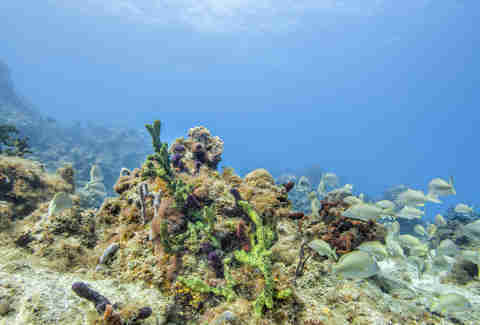 The park is home to 67,000 acres of coral reef, at the end of the Florida Reef system. Because it sits so far away from land and in a protected area, the reef hasn’t been nearly as damaged by humans, and has more marine life than you’ll find in the rest of the state. The waters are also remarkably clear, especially in the summer, which makes the snorkeling here better than the diving in most of the keys. By day you’re likely to see nurse sharks, parrot fish, angelfish, moray eels, and all sorts of tropical fauna. If you stay overnight, bring a dive light with you and swim the fort’s moat wall at night. It’ll change the way you perceive undersea life, and you’ll see rare nocturnal creatures like octopus and basket starfish. The ferry service has gear you can borrow, but if you go on your own you'll need to bring your own gear. The Dry Tortugas sat smack in the middle of trade routes from the Gulf of Mexico to the Atlantic, and because of the shallow coral reefs, they were the cause of many a shipwreck. Those reefs and wrecks make this one of the most diverse dive sites in America. The best dive -- and the most popular -- is the wreck of the Windjammer, an iron-hulled ship that wrecked off Loggerhead Key in 1901. For reef diving, Pulaski Shoals is the easiest dive with the most diversity. It’s a series of reef heads with remains of multiple wrecks, and schools of fish that feed off the coral. And because this park is so remote, all of it is in far better shape than you’ll find elsewhere in Florida. Of course, this kind of remote beauty comes with a price. And in this case that price is an overnight live-aboard dive trip, which can run upwards of $2,000. Because day trips to Dry Tortugas don’t leave enough time to dive, your only option is to book a trip through a Key West dive shop. And none offer day trips. The overnights aren’t cheap, but for a dive enthusiast it’s worth treating yourself. When John James Audubon visited here in 1932 he said, “I felt... as if the birds would raise me from the ground, so thick were they all around.” And birders have taken note, making this park one of the top birding destinations in North America. The fish that swim around the reefs make this a popular spot for frigate birds, and every September 100,000 sooty terns nest here. The rare black noddy has also been spotted in Dry Tortugas, as well as red-footed boobies and golden warblers. About 300 species of birds live here, many of them year round. And even if you’re not an avid birder they’re a spectacular addition to the scenery. 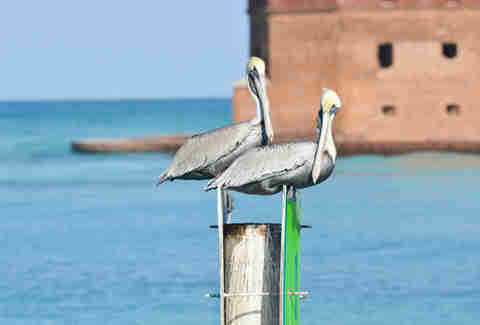 The most popular way of getting to Dry Tortugas is the National Parks Service's ferry, the Yankee Freedom III. The 2.5-hour ferry ride is a magical trip over turquoise waters, and leaves you about four to five hours on the island if you're making a day trip. 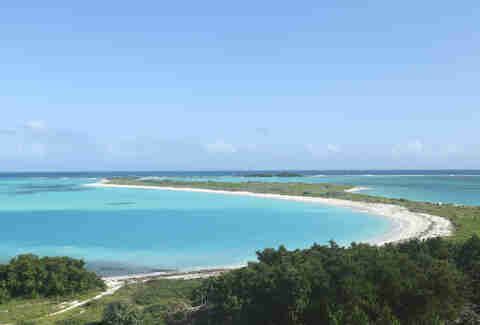 It includes a ranger-led tour of Ft. Jefferson and costs $175 per person. 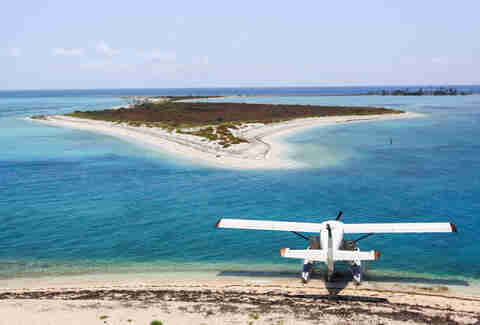 You can also access the island via seaplane from Key West Airport. The flight is only about half an hour to 40 minutes, but most seaplane tours only allow two to three hours on the island. These flights average about $300 per person, depending on the operator. Private boats are also allowed in the park, but can only dock during daylight hours, and not between 10am-3pm, when ferries are docked. This is your best option if you want unlimited time in the park, or if you want to dive. Docks on the other keys are for government use only. 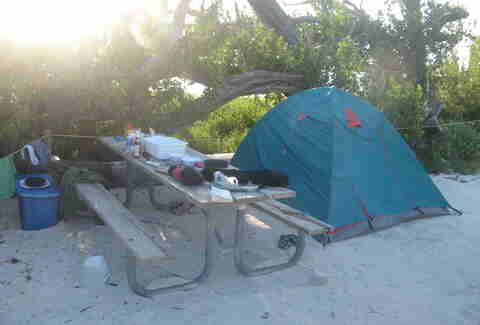 Garden Key, home of Ft. Jefferson, has one campground with 10 primitive first-come, first-served campsites -- eight individual, one group, and one grassy overflow area -- and come with some of the most incredible sunsets and stargazing you'll ever see all for only $15 per site, per night. All campsites have a three-night maximum if you arrive via ferry, or 14 days if you come via private boat. Ferries have space for 10 campers each way each day, but seaplanes won't carry camping gear. 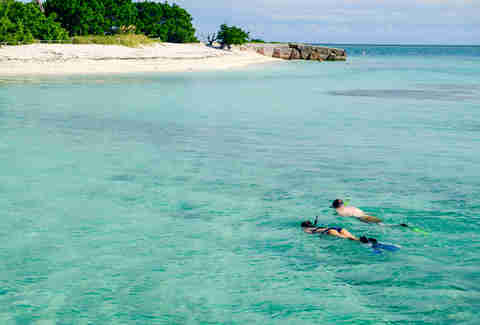 The water is calmest during the summer, which makes for the clearest water and best snorkeling/diving. It’s also when the sea turtles come on land and lay their eggs, so if you don’t mind heat (average highs hover around 90 degrees from June through September) and a greater chance of rain, this is the best time. October brings cooler temperatures but also choppier waters, making for more unpleasant ferry rides and less visibility when snorkeling or diving. April to mid-May is the best time for birding, as that is peak migration season.